Apowersoft Video Converter Studio is a powerful tool that makes it easy to convert videos into a wide range of different formats, with a built-in editor to trim, apply filters, create watermarks and even add captions. 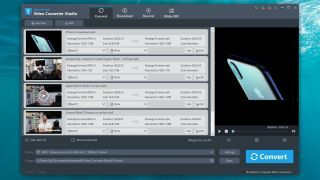 That's not all, though – Video Converter Studio also includes a brilliant downloader for grabbing clips from YouTube and other popular video hosting sites (with permission, of course). You can download videos in batches, then send them straight to the conversion tool with a single click. There's also a highly customizable screen recorder that can capture your whole desktop or a specific area, and a slideshow maker to transform your photos into stunning presentations. As a TechRadar reader, you can get all this free for a whole year. The offer ends on November 1, so download Apowersoft Video Converter Studio and activate your subscription today. To get your free subscription, download and install Apowersoft Video Converter Studio, then launch the program. Select an aspect ratio to start a new project and you’ll be prompted to log in. Select ‘Log in & sign up’, and either create a new account using your email address or log in using a social media account. Once you've logged in, click the account icon (shaped like a person) in the upper right of the window, click your account name and click ‘Activate’. Enter the activation code 41A85-864D3-MCBIE-DC72F, then click ‘Confirm’. That's it – enjoy your free VIP subscription.